In August, swollen bladderwort plants become noticeable along shorelines of ponds, thanks to their spoke-like inflated leaves. Like other bladderworts, swollen bladderworts catch and digest small water creatures in tiny underwater traps. Carnivorous plants in Westborough? Yes, it's true. Look to Westborough's ponds to find small flowering carnivorous plants known as bladderworts floating on the surface of the water. The notion of a carnivorous or flesh-eating plant usually brings to mind the Venus flytrap (Dionaea muscipula), native to a small area of North Carolina. Many people who've seen these famous plants haven't traveled to North Carolina. Potted Venus flytraps regularly appear for sale in supermarkets. You needn't go to North Carolina or even the supermarket to find our very own native carnivorous bladderworts (Utricularia). Westborough has at least three different kinds floating on its waters, or sometimes on really wet mud, in summer. Two have small yellow flowers, and one has small purple flowers. 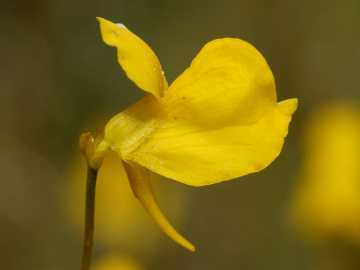 The flowers aren't the part of the bladderwort that makes it carnivorous. And unlike Venus flytraps, bladderworts don't have leaves that snap shut on unsuspecting flies. Instead, the carnivorous action takes place under water, where we don't get to see it. Bladderworts are named for their underwater traps. Their feathery underwater parts bear many tiny, pod-like bladders about the size of a dried lentil. People once thought the bladders were tiny flotation devices, but the bladders are really traps. Each little pod has a trap door and a hair-like trigger. There's a partial vacuum – lower water pressure – inside. Small purple bladderwort plants can cover the surface of a pond. They create a "field" of many small flowers that bees and wasps visit. These insects are pollinators, not prey. This flower is barely more than half an inch long. How do the traps work? When a tiny water creature touches the hair trigger, the trap door rapidly opens inward, sucking in water and the tiny prey. The door then shuts just as rapidly. The trapping action takes only a fraction of a second. You can't see the trapping action but sometimes you can hear it. If you lift a bladderwort plant out of the water and hold its feathery underwater leaves and pods near your ear, you may hear little popping or crackling noises – the sound of traps closing. Once the prey is digested by enzymes – digestive juices – from hairs inside the bladder, the trap re-sets. A sticky substance makes a seal around the trap door, and the bladder pumps out some water, creating lower water pressure inside. Now the trap is ready for another creature, perhaps a mosquito larva or water flea. Once you know about bladderworts, they're not hard to find on our ponds in the summer. Most of the plant is underwater, with a network of narrow, thread-like leaves that catch on people's fishing lures. Bladderworts have no roots, just stems and leaves. You're most likely to spot bladderworts when they bloom. Thin stems hold the showy, small blossoms a couple of inches above the water, where they attract bees and wasps. These insects aren't prey. They come for nectar and pollinate the plants in the process, just as in other plants. The flowers look somewhat like small snapdragon blossoms. They're a little more than half an inch long. Swollen bladderwort (Utricularia inflata) is probably the easiest to spot because it floats on a set of swollen leaves that stick out around the flower stem like the spokes of a wheel. These fat spokes make the whole plant more obvious to human eyes. Mid- to late August is a good time to look for swollen bladderwort. It usually blooms on Sandra Pond. Check the water's edge, especially on the island that you reach by crossing a wooden bridge in Bowman Conservation Area. 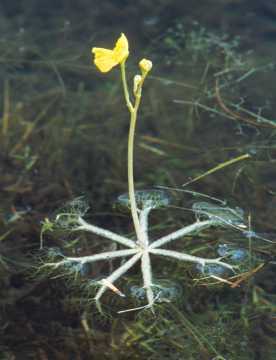 Horned bladderwort usually grows in water-logged mud. It is named for the long "horn" that contains nectar. Its trap-like bladders are hidden deep in the wet mud. 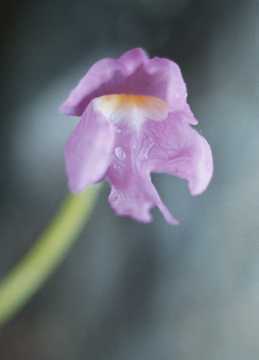 Purple bladderwort (Utricularia purpurea) blooms at different times in different places, depending on conditions. It's usually out in the middle of a pond, where large numbers of plants form a kind of mat. Its many small purple flowers give the water's surface a purple tinge. Look in Sandra Pond on the Bowman Conservation Area side in late August. Or next July, look in the beaver pond (near Rte. 135 close to the Northborough line) at Mass Fish and Wildlife. Horned bladderwort (Utricularia cornuta) also grows at the same beaver pond, mainly in early July, in the wet mud near the dirt road. Notice the long flower spur or "horn" that gives the plant its name. This horn contains a supply of nectar. If you have a canoe or kayak, join biologist Scott Shumway for a paddle on Mill Pond on Sunday, September 9 at 1:30. He plans to point out bladderworts and many other plants and animals. Meet at the Mill Road boat ramp for this special excursion sponsored by the Westborough Community Land Trust. Why do carnivorous plants eat animals? What do bladderworts get from their animal prey? The answer is – fertilizer. Or, to put it another way, food supplements. These plants can survive without consuming animals, much as other green plants do, but they grow much better if they get an animal meal regularly. Their animal prey gives them nitrogen and phosphorus – key ingredients in fertilizer–and perhaps other mineral nutrients as well. Plants use these nutrients in making plant proteins. The result is more leaves, more flowers, and better reproduction. On a larger scale, the answer to the question of why these plants need extra nutrients from animals has to do with the environments where they grow. In eastern Massachusetts, our ponds and lakes are usually somewhat acidic, due to the generally acid soils of the region, to tannins from oak leaves, and perhaps to acid rain. These acidic waters slow the process of decay that releases nutrients from dead plants and animals, so the waters are relatively poor in nutrients. Bladderworts get around this problem. As you look at our ponds in late summer, think of the life that's teeming, unseen, within them. Bladderworts remind us of the many relationships and life-and-death challenges in nature, nearby but just beyond our everyday awareness.